The history of sports in Philadelphia is littered with characters that seem more fit for fiction than for reality. 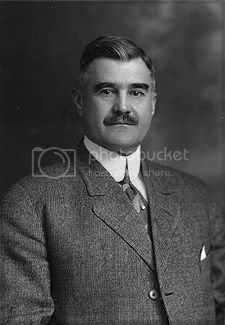 Right up there in the Bizarre Hall of Fame is Horace S. Fogel, a former Phillies owner whose career began in sportswriting and ended with a lifetime ban from baseball. This is his story. 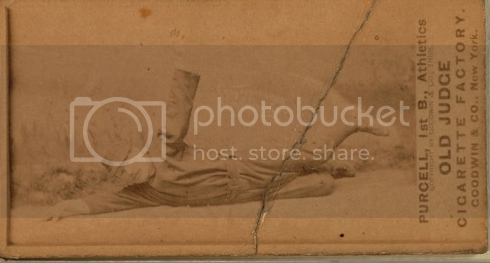 Fogel was a Pennsylvania native, born in Macungie, Lehigh County in 1861. He started out as a telegrapher and then began a career in journalism at the Baltimore Day. 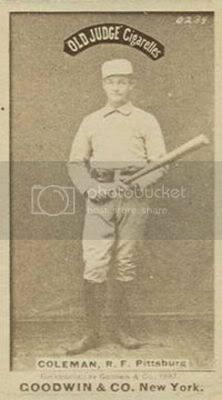 He returned to Philadelphia in 1883 and was offered a job at the Philadelphia Press, where he was in charge of the telegraph service but covered baseball for extra money. At the time, newspapers weren’t covering the sport and Fogel found a niche by publishing several columns a day. The next year he took a job as official scorekeeper for the Athletics, getting his foot in the door of professional baseball. In 1887, he was hired as manager of the Indianapolis Hoosiers of the National League and led them to a last place finish. His managerial stint lasted less than a year and ended with a 20-49 record. After his unsuccessful bid to manage a pro ball club, he went back to journalism and became associate editor of the Sporting Life as well as head of the baseball department at the Philadelphia Public Ledger. After 15 more years in sportswriting, Fogel was again given a job as skipper, this time for the New York Giants in 1902. His second attempt at managing was literally laughable. The press was highly critical of Fogel, who was deemed “hardly fitted” to manage the team. 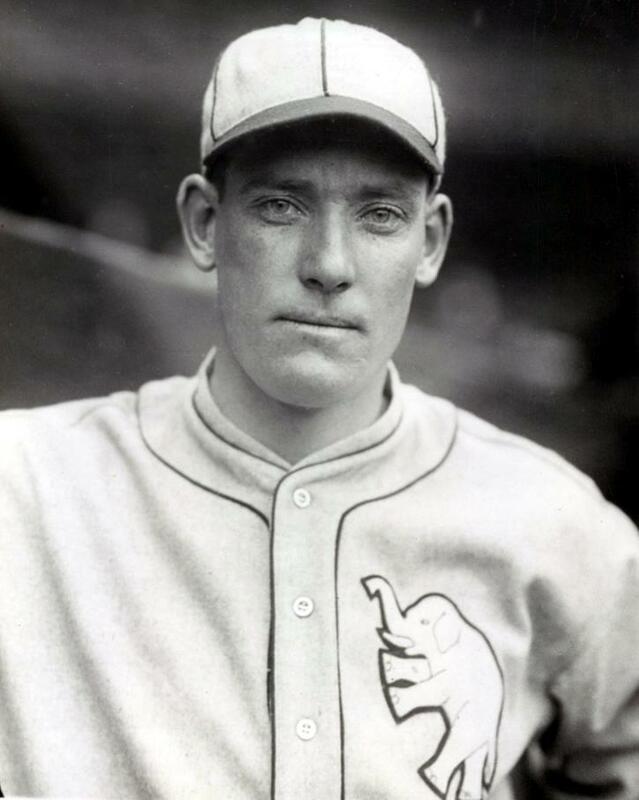 He openly criticized players which “stirred up discord, and the team which left Polo Grounds early in May harmonious to a man returned on Decoration Day nearly split in twain by dissension.” Most notable from his time with the Giants was his managing of Christy Mathewson, the second year pitcher who won 20 games in his rookie year. Fogel didn’t think much of Mathewson’s skills on the mound, so Fogel converted him to a first baseman, then an outfielder, then a shortstop. Fogel was hammered for this decision, which was referred to as “the baseball crime of the century.” Luckily, Fogel was fired just three months into his tenure. Mathewson was put back where he belonged and went on to a Hall of Fame career of 373 wins and a lifetime 2.31 ERA. From 1902 through 1909, Fogel again went back to the sports page. He was the sporting editor for the Philadelphia Telegraph. By this time in his career, he was a known commodity: a loudmouthed front-runner with little-to-no credibility. When the local teams weren’t doing well, he crushed them. When they strung a few wins together, he announced they were unbeatable. He had no problem overstating his opinions and often feuded with players in print. So in November of 1909, when it was announced that Fogel had purchased the Philadelphia Phillies, the public was more than surprised. First, with Fogel’s unsuccessful managerial track record, people were concerned about the state of the team. And second, everyone knew Fogel couldn’t have come up with the $350,000.00 to $500,000.00 that bought the team. The not so unspoken rumor was that the Taft family of Cincinnati and Charles Murphy, President of the Chicago Cubs, were the real financial owners of the Phillies and were simply using Fogel as a figurehead. One would think that one man with a stake in two National League teams would be an issue, but other than some reporters questioning the deal, no real investigation was conducted. The name Phillies is too trite. It has come to mean a comfortable lackadaisicalness, the fourth-place groove. And Quakers stands for peaceful people who will dodge a fight. We’re not going to be that way. We’re going to get into fights. And with that explanation he urged everyone to adopt his new name for the National League club: The Philadelphia Live Wires. To promote the name, Fogel even came up with a new “logo,” which featured an eagle grasping sparkling wires. Thankfully, other than a few references in newspaper articles in 1910, the new name didn’t stick and fans continued referring to the team as the Phillies. Fogel’s antics continued through his ownership years and his pregame festivities were memorable. In addition to a concert before every home game, he often held three-ring-circuses on the field before the games. He once had a couple married in a lion cage on the pitcher’s mound with a lion serving as the witness to the nuptials. Another time he released 100 pigeons in the city with free tickets to the next game attached to their legs. His gimmicks didn’t lead to much success on the field. 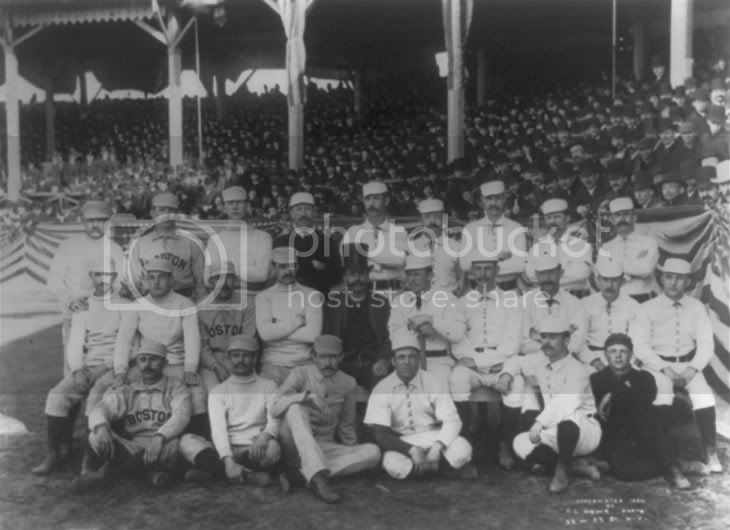 In 1910, the Phillies finished three games above .500 and in 4th place in the NL; 1911 brought another 4th place finish (even with rookie Pete Alexander’s 28 win season); and in 1912, the Phillies finished in 5th place. It was in the latter stages of the 1912 season that Fogel stepped over the line. 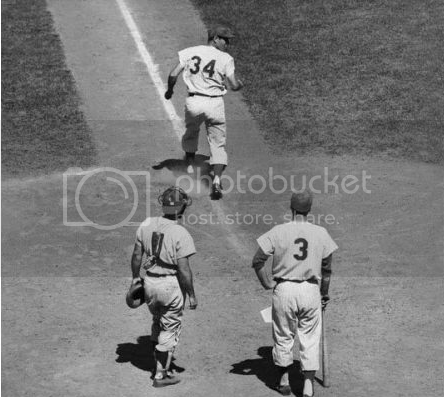 At that point in the season, the New York Giants were pulling away from the Chicago Cubs for the pennant. Fogel was known to be a drinker and card-player and he maintained close relationships with his newspaper buddies. So in August and September of the 1912 season, with the Phillies well out of the race, Fogel was seen drinking more and more with his old pals. When the alcohol was flowing, so was Fogel’s mouth. He started a one-man campaign accusing the National League of a conspiracy theory to give the New York Giants the pennant over his Phillies (who finished 30.5 games back) and the Cubs (whose ownership Fogel was inextricably linked with). The conspirators in his theory included not only league brass, but also other National League teams. 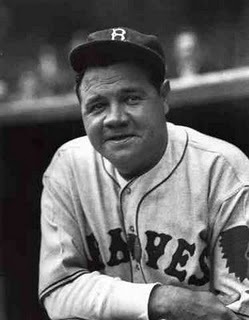 He first accused St. Louis manager Roger Bresnahan of not fielding his regulars in games against the Giants and throwing the games in favor of the New York team. Then he wrote about the “fix” to everyone who would listen and published several articles about it in a few separate newspapers. 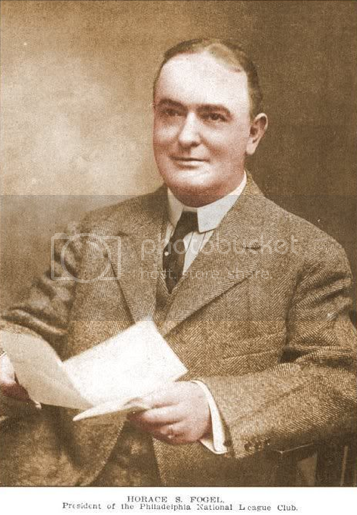 He wrote a letter to Thomas Lynch, league president, stating his position that Lynch had instructed umpires to call games in favor of the Giants and against the Phillies in a plot to ensure the Giants would win the pennant. 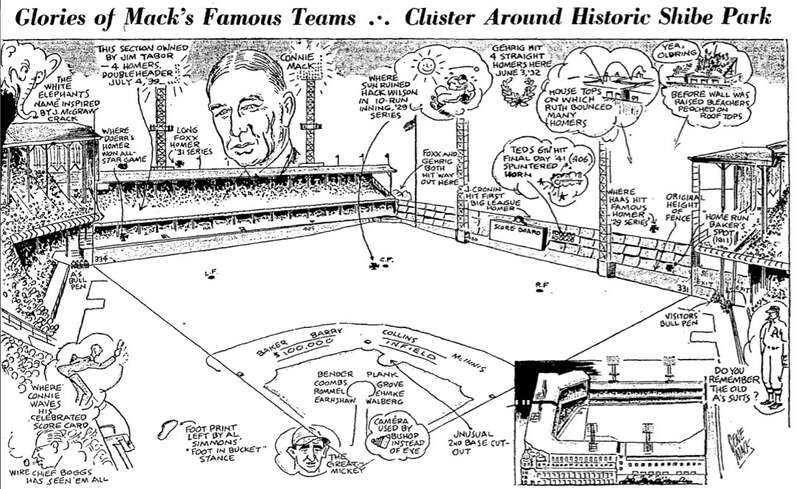 In September, he wired the owner of the Reds and stated that the pennant race was “crooked.” He published an article in a Chicago newspaper that alleged the Giants “won at least twenty-one games because of unfair umpiring.” He also wrote to seven other owners of teams in the National League calling the pennant race dishonest and insinuating he had proof of wrongdoing. As far as President Fogel’s attacks on the President of the National League is concerned, I care nothing. My 25 years’ record in baseball speaks for itself. The cowardly attack on the honesty of the umpires and the game itself is a different matter, however, and cannot be overlooked. I shall take these charges of President Fogel before the board of directors of the National League, which has sole jurisdiction. Regardless of whether Mr. Fogel has a financial interest in the Philadelphia Club or not, he is the president of that organization, and the charges he makes can only be handled by the league itself. A league investigation of Fogel’s baseless charges turned out to be the worst thing that could have happened for him. After a short investigation which turned up no evidence at all, Lynch charged Fogel with several counts of improper conduct and called a hearing to take place in New York on November 27, 1912. 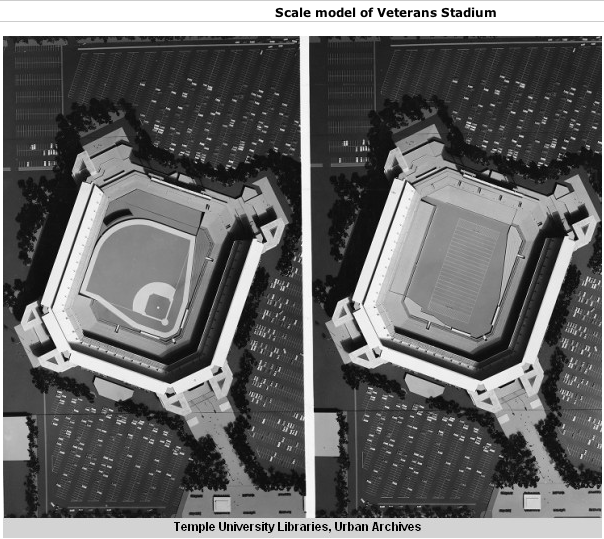 All of the National League owners were present and heard testimony from several witnesses over the course of two days. Fogel’s only defense was that the charges were moot and the National League had no jurisdiction over him. Fogel had resigned as the Phillies’ President 5 days before the hearing and named Alfred Wiler, the Phillies’ VP, his successor. Fogel’s weak attempt to avoid punishment didn’t work. In a vote of 7-0 with one abstention (Wilner), Fogel was found to have lodged unsubstantiated claims against the integrity of the game and was deemed guilty of Lynch’s charges. His punishment was severe: Fogel was forever banned from baseball. After the decision, Fogel claimed “the jury was packed against [him]” and that he wouldn’t obey the decision. 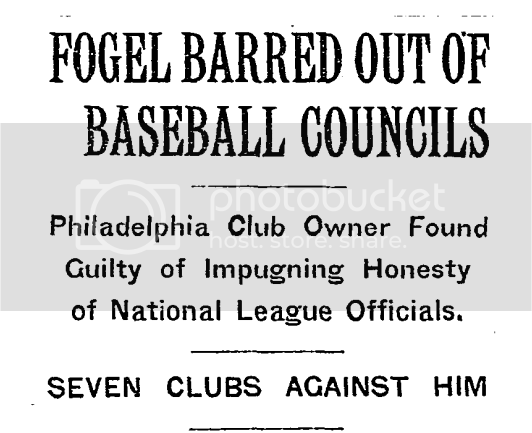 He stated, “I will sell or represent as I please, the Philadelphia club in the National League as long as I feel inclined to do so and no one can disturb me from doing so.” Fogel also threatened to bring this matter to the court system. However loud Fogel’s bite after his censure, his bite was non-existent. There was defiant refusal to submit to the decision, no appeal to the court system, no nothing…Fogel was out of baseball. His reporting career continued in true Fogel-fashion. In 1920, he published an article in the Inquirer charging that both the the 1905 World Series and 1908 World Series were fixed. 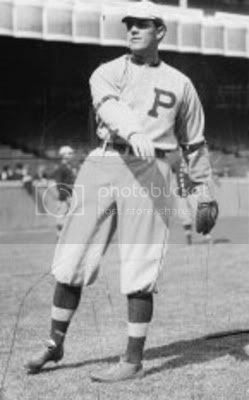 He cited “sources” who alleged that Athletic’s pitcher Rube Waddell didn’t pitch in the 1905 series because New York gamblers bribed him with $17,000 and that during the pennant race in ’08, several Phillies were paid thousands of dollars by a member of the NY Giants to sit out games. Not surprisingly, these claims were unsubstantiated and flatly rejected as falsehoods. Fogel lived out the rest of his life in Philadelphia and died in 1928 at the age of 66. We are all lucky that the public saw Fogel for what he was: an eccentric sideshow. Otherwise, we might all be wearing green shirseys with “Live Wires” on the front. RELATED: Phillies owner William Cox banned for life. 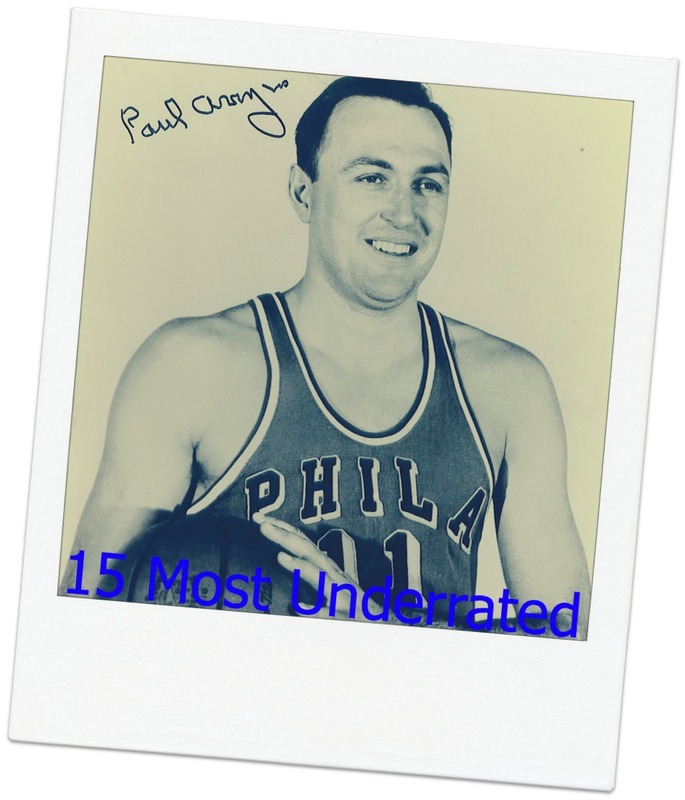 We’d love to think all of our hometown players throughout history were the “good guys.” Philadelphia athletes reflect on Philadelphia, and therefore, on Philadelphians as well. Even if they don’t make All-Star teams or bring us a championships, we remain ardently devoted to any player who works hard on the field and carries himself well off the field. It’s a lot more fun to relive the good guys, but we know not all of our players have lived up to that standard. And because this is a history site, not a party-line blog, we bring you stories of both the good and bad. 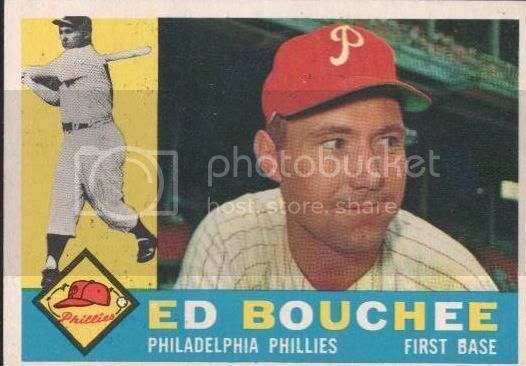 Ed Bouchee broke into the majors with the Phillies in 1957. He batted .293 with 35 doubles, 8 triples, 17 home runs and 76 RBI, which placed him 2nd in Rookie of the Year voting. The Montana-born Bouchee had quite a career ahead of him, and fans quickly jumped on the Bouchee-bandwagon. However, it didn’t take long for off-the-field issues to hurt the rising star’s career. In the end, Bouchee pleaded guilty to two counts of indecent exposure involving the 6 and 10-year-old girl. 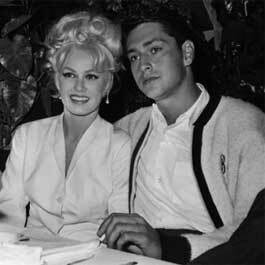 A psychiatrist testified that Bouchee suffered from “compulsive exhibitionism,” a neurosis caused by emotional illness. Indecent exposure to a minor is a felony in Washington state that, at the time, carried a maximum of 20 years in prison. However, Bouchee was placed on probation for 3 years and forced to undergo psychiatric treatment. With the sentence, Bouchee was also indefinitely suspended from baseball. He was admitted to the Institute for Living in Hartford, Conn. in early March and discharged on May 30 after his doctors determined he had recovered. It was the only decision I could live with…I have made an exhaustive study of all the evidence and I am convinced Bouchee is completely cured…If there was any evidence that he would fail again, I would not have reinstated him. I am assuming sole and complete responsibility. When Bouchee returned to the Phillies, he was generally accepted back by his teammates and fans. However, he never matched the production of his rookie year. He played in Philadelphia until 1960, when he was sent to the Cubs. He played his last year in the majors in 1962 as a member of the 40-120 expansion Mets. Today, Bouchee is reportedly living in Arizona, maintaining the low profile he has kept since his guilty plea. The 1964 Phillies are remembered as the team whose season was 12 games too long. Up 6.5 games with 12 to go, the team began a 3 game set with the second-place Cincinnati Reds. In the 7th inning of the first game, with the score knotted at 0-0, Chico Ruiz stole home against Art Mahaffey and the Reds held on to win 1-0. That game kicked off the biggest choke-job in the history of Philadelphia sports, as the Phils went on to be swept by the Reds, the Milwaukee Braves, then the St. Louis Cardinals during a 10-game losing streak that ended all hope for the postseason and that haunts old-time Phillies fans to this day. 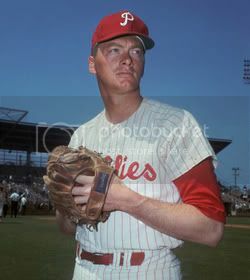 But before the Phillies made the kind of history we’d all like to forget, Jim Bunning made the kind of history that we are all happy to remember. 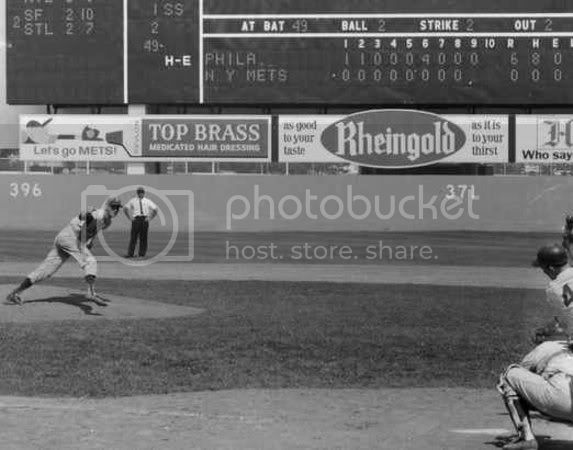 On June 21, 1964 the Phillies faced the Mets in a Father’s Day double-header at Shea Stadium. 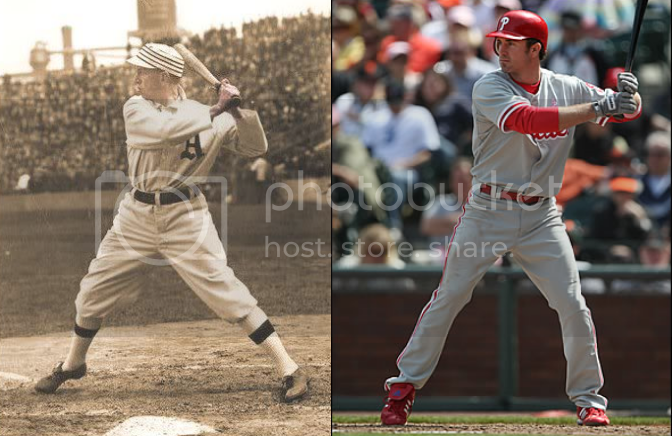 Bunning, who was enjoying his first year in a Phillies uniform, was slotted against Tracy Stallard in Game One. Bunning was flawless as he faced 27 batters and retired them all in a 6-0 win. His was the first perfect game in team history and the first in the National League’s modern era. 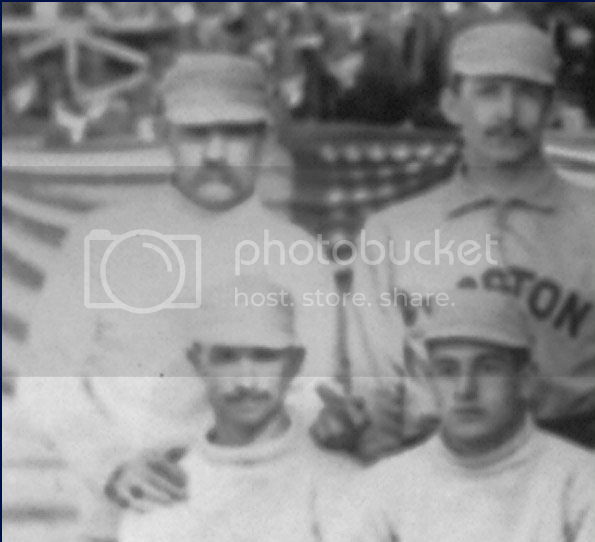 The previous NL perfect game came in 1880. Also, check out this great MLB Network video of Bunning’s perfecto, which includes footage of the final three outs. Bunning finished the ’64 season with a healthy 19-8 record and a 2.63 ERA. 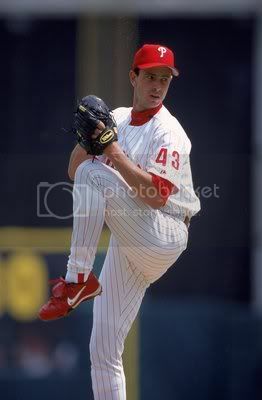 However, he was just 1-3 in his final four outings during the Phillies collapse. Partly to blame was Phils’ manager Gene Mauch who threw Bunning on short rest after hitting the panic button (Bunning started 4 of the final 9 games of the season). After the ’64 season, Bunning pitched three more years with the Phillies and put up solid numbers. However, he never reached the postseason in Philadelphia and after the ’67 season in which he led the NL in strikeouts, he was shipped off to Pittsburgh. He retired in 1971 and was elected to the Hall of Fame in 1996. Though it was overshadowed by the final stretch of the season, Jim Bunning’s perfect game on June 21, 1964 set a standard that no Phillies pitcher matched until Roy Halladay did so 46 years later. 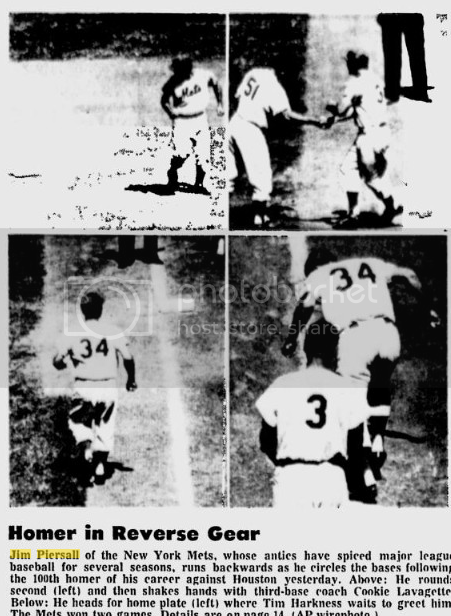 On June 14, 1949, the Phillies played the Chicago Cubs on the road and won by a convincing score of 9-2. 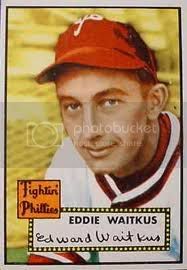 Newly acquired Phillies first-baseman, Eddie Waitkus, continued his solid season by going 1-4 with 2 runs scored. After the game, he joined his roommate Monk Meyer for dinner and returned to the team hotel at about 11pm. 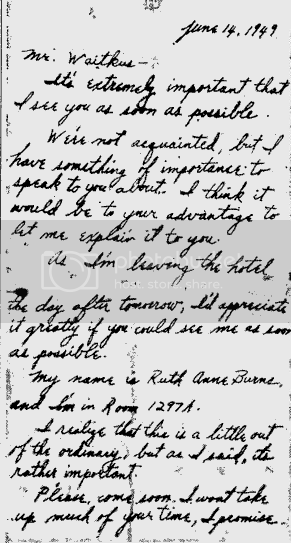 When Meyer and Waitkus got to their room, they found a note addressed to Waitkus from Ruth Ann Burns. 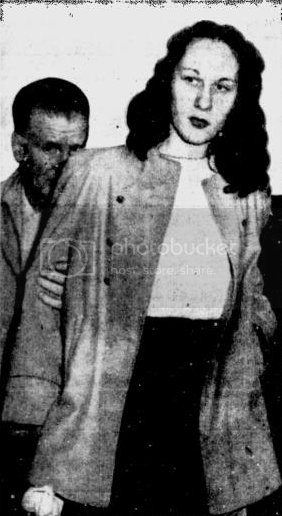 Waitkus had a “girlfriend” named Ruth Martin, who he sometimes saw on the road, so he followed the note’s instructions and headed up to her room. On his way up to that room, Waitkus could not have known that instead of making time with his road girlfriend, he would instead be put on death’s doorstep. Born in Cambridge, MA, Eddie Waitkus broke into the majors in 1941 with the Chicago Cubs. After playing only 12 games in the ’41 season, Waitkus joined the army and fought in World War II where he earned four battle stars. He rejoined the Cubs in 1946 and his professional baseball career took off. Generally known as the best defensive first-baseman in the National League, his offensive production steadily increased each year. In 1948, he batted .295, stole 11 bases, scored 87 runs and doubled 27 times and was selected as a National League All-Star. 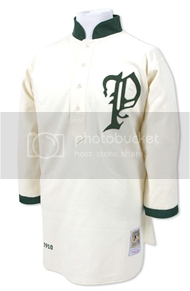 After the ’48 season, with Waitkus’ value at it highest point, he was traded to the Phillies. When Steinhagen realized the Phillies would be visiting her hometown Cubs on June 14, she jumped into action. She booked a room at the Edgewater Beach Hotel, where she knew the Phillies, and Waitkus, would be staying. 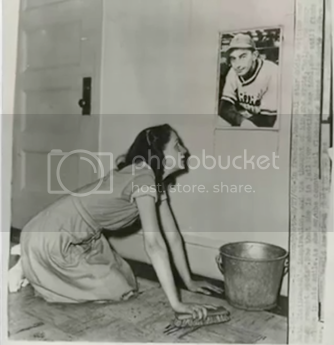 She brought a suitcase full of baseball statistics, pictures of Waitkus, newspaper clippings about the first-baseman and 50 ticket stubs from the ’48 season. After attending the June 14th game, she went back to the hotel and ordered a few drinks to be brought up to her room. When the drinks arrived, she paid the bellhop $5 to bring this note to Waitkus’ room. And then she waited. When Waitkus arrived, she told him that she was a friend of Ruth’s and that Ruth had just stepped out for a moment. Waitkus believed her and walked past her into the room. He didn’t notice she was holding a knife. As Waitkus sat down, Steinhagen told him that she wanted to give him a surprise. By this time, Steinhagen was an attractive, 6 ft, 19-year-old brunette, and Waitkus was probably expecting a good surprise. However, instead of Steinhagen returning from the bedroom closet having “slipped into something more comfortable,” she came back with the .22 calibre rifle she had purchased a week prior. She told Waitkus “For two years you’ve been bothering me, and now you’re going to die” and pulled the trigger. The bullet hit Waitkus in the chest just below his heart, lodged near his spine, and collapsed his right lung. After seeing Waitkus slump to the ground, Steinhagen called the hotel front desk and confessed to the shooting. Her quick phone call ended up saving Waitkus’ life, as medical personnel arrived on the scene immediately and rushed Waitkus to the Illinois Masonic Hospital. He underwent a number of surgeries and recovered from the gun shot wound. Steinhagen was arrested and charged with assault and attempted murder. She told police she shot Waitkus because she was “infatuated with him” and “wanted to feel the thrill of murdering him.” A jury found her legally insane and she was committed to a mental hospital. After receiving 3 years of shock treatment, she was declared “sane” and released. In the end, her criminal charges were dropped. After Waitkus was discharged from the hospital, he began an intense rehabilitation program in Clearwater, FL. His hard work paid off, and he returned to play every game with the 1950 Pennant-winning Whiz Kids. The Associated Press named him Baseball’s “Comeback Player of the Year.” Waitkus played five more seasons, though he never lived up to his pre-injury potential. He ultimately retired in 1955. If you think this story would make a great movie, you’re right. Although Eddie Waitkus may not be a household name, you’ve already heard his story. Waitkus was the source for Bernard Malamud’s famous character Roy Hobbs in The Natural, which was adapted into the 1984 Robert Redford movie of the same name.